Joseph Prentice was born and brought up in the Chelmsford area. He first joined the army in October 1903 and having left then served as a police officer in 1907. He married in December 1910, had three children, worked as a miller and then at Chelmsford Golf Club. He was recalled to the army at the outbreak of the war and died from wounds in May 1915 near Ypres. His home was in Galleywood. A step-brother also lost his life during the war. The 1911 census found the couple living together at Bridge Cottage in Springfield. 27 year-old Joseph was a general labourer on a golf links (Chelmsford Golf Course). The couple subsequently had three children: Joseph Prentice (born on 29th April 1911, died in 1955), Sydney Reginald Prentice (born on 5th February 1913, died in 1964) and Gladys Evelyn Prentice (born on 18th April 1915). Your Commanding Officer and Brigade Officer have informed me that you have distinguished yourself by conspicuous bravery in the field. I have read the report with great pleasure. Joseph was originally buried at Cainers and today lies at Etaples Military Cemetery, Pas de Calais, in France (grave: II. A. 4) – one of more than ten thousand soldiers buried there, most of whom succumbed to wounds before they could be evacuated from France. His daughter Gladys was just six weeks old when he died. Etaples, close to the Channel coast, was major centre for military hospitals – later it was home to eleven general, one stationary, four Red Cross hospitals and a convalescent depot, which could deal with 22,000 wounded or sick. Joseph is commemorated on the Civic Centre Memorial, Chelmsford, the Galleywood War Memorial and on the Springfield Parish Memorial at All Saints’ Church. He was entitled to the Victory, British War and 1914 Star medals. The 1918 register of electors listed Joseph’s widow at Well Lane in Galleywood. Joseph’s daughter Gladys Evelyn Prentice married Robert Evans of Sandon in 1937 at St. Michael’s Church in Galleywood. The couple went on to have two children, and Gladys eventually died on 10th May 2007, aged 92. Joseph’s step-brother, Ernest John Everitt, also lost his life in the First World War and is also commemorated by Chelmsford’s Civic Centre Memorial. Joseph was born in Springfield on 19th May 1886, the fourth son of Charles Prentice and Sarah An Prentice (nee Patient). Joseph’s father had been born in 1842 in Good Easter, his mother in 1848 in Mashbury. The couple had married on 5th June 1865 in Mashbury where both were living at the time. In 1871 they had been resident in Good Easter, and in 1881, back at Mashbury. His siblings included Elizabeth Prentice (born in 1868), Henry Charles Prentice (born in 1871), David Prentice (born in 1874), Jane Prentice (born in 1877), Frederick Prentice (born in 1881), Emma Prentice (born c1884), John Prentice (born c1889) and Nellie Prentice (born c1892). The children had been born in several mid Essex rural parishes – Good Easter, Mashbury, Margaret Roding and Springfield, perhaps indicative of the itinerant nature of Joseph’s father’s work. were agricultural labourers. Joseph’s father died in 1894, aged 53, and his mother subsequently married a widower George Everitt in 1899 ten years her junior. Joseph was educated in Springfield. The 1901 census recorded Joseph, now 15, living with his mother, three siblings, step-father and four step-siblings in Waterhouse Lane, then in the parish of Writtle, now part of Chelmsford. Joseph was an errand lad, his step-father a stockman, presumably on Great Waterhouse Farm. 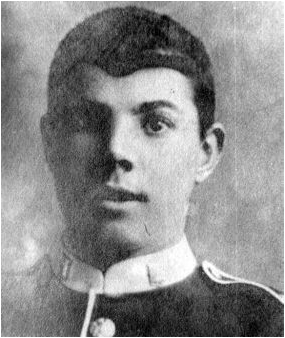 Joseph first enlisted on 5th October 1903 and served three years in the Colours with the Essex Regiment, seeing service in Malta amongst other places. He then went on the reserve list. On 8th May 1907 he joined Essex County Constabulary. He worked in the Southend area but resigned only a few months later on 31st December 1907. Joseph married Alice Tarling, the daughter of William Tarling, on Boxing Day 1910 at Shelley near Ongar. At the time Joseph was aged 27, living in Springfield and employed as a miller. His 23 year-old bride was daughter of William Tarling, a carman, and she lived in Shelley. She had been born there c1888.